All transactions are safe and secure with a reliable history in online purchasing behind each of our associates. Buy the Super Childish t-shirt to own Batman clothing and merchandise. 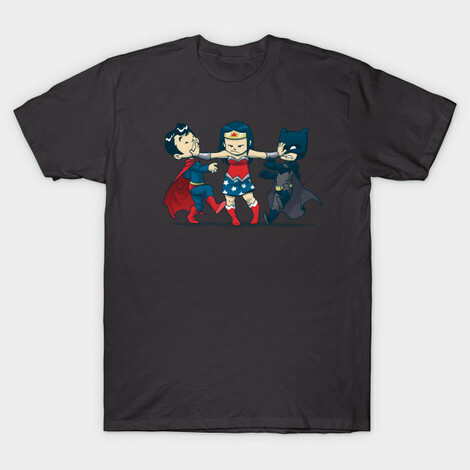 This Super Childish Batman tee displays Wonder Woman breaking up a fight between Batman and Superman. Their constant bickering does make for a funny Batman t-shirt. After all, the Caped Crusader uses intelligence to beat the Joker, not just his muscles, so he might fair okay against Superman. He's always ready to answer the Dark Knight Bat Symbol when it shines. Pair this humorous design with a Dark Knight t-shirt or vintage Batman apparel, which will provide a nice balance to your collection of modern and retro Batman clothes. Match it with a hat. In addition to the Super Childish tee above, browse the Batman Clothing Gallery for more apparel like men's and women's clothes, kids shirts or hoodies.